It was disheartening to read the headlines from this news report that said Kansas City and elsewhere, zoos brace against the threat of species extinction. It's as if the orangutans are doomed to an existence merely in zoos located thousands of miles from their natural habitats. We can't let this happen. Their population levels have plummeted for sure in the past two decades as timber, palm oil and mining ripped apart their habitats in Malaysia and Indonesia where these animals are found. If the situation in both countries remained in "business-as-usual" mode where forests were removed with zero regard for what lived in them, then yes, the orangutans are doomed but these are different times and we have to take new approaches to ensure their survival outside of zoos. 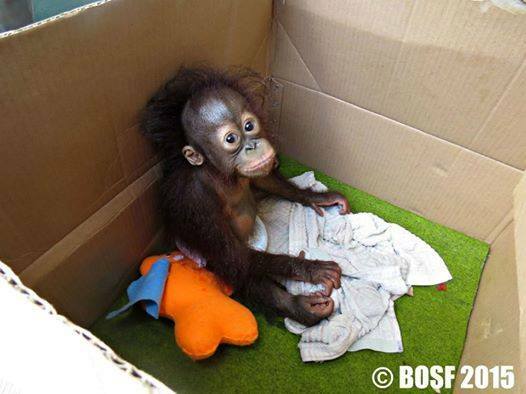 The orangutan has to be the most iconic victim of the push for development in Malaysia and Indonesia. As the only great ape found in these two countries, its soft brown eyes and human-like character has endeared it to activists who will swear publicly that they boycott palm oil as a personal statement to saving orangutans. Sidenote to these people: the rubber tires on your cars or bicycles have also been identified as a destroyer of orangutan habitat. 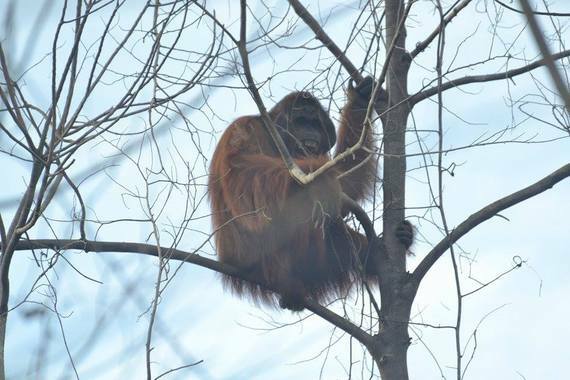 Or If you take public transit and read up on orangutan issues on your made-in-China electronic gadget while dressed in made-in-India clothing, you could also be contributing to the loss of orangutan habitats as coal mining in Indonesia remains one of the big reasons for their habitat loss. Of the three subspecies of orangutans on Borneo island the Pongo pygmaeus morio in Sabah state and Pongo pygmaeus wurmbii in Sarawak, Malaysia both survive in a relatively stable environment. The two thousand plus orangutans in Sarawak are reported to be in new safer environs. This is due mostly to the new Chief Minister of the state, Adenan Satem, who has stunned the public in wanting to protect the remaining natural environment in Sarawak. Declaring recently in London, England that the state has enough palm oil and timber plantations, his government played a key role in freezing three hundred and seventy bank accounts belonging to companies suspected as being involved in illegal logging in the state. All of this bodes well for orangutans in Sarawak and I hope the CM will heed the advice of conservation groups that have called for the protection of its remaining forests. The population of orangutans in Sabah have also stabilised over the years due mostly to the tenacious efforts of the Minister of Environment, Datuk Masidi Manjun and the Sabah Wildlife Department which has recognized that tourism can be a source of revenue that does not involve the removal of rainforests. It also helps that conservation work in the state is well funded by the Malaysian palm oil industry. It's the Indonesian populations of wild orangutans that are a question mark if new approaches are not tried. As a country where 40 percent of its population, or 98 million people, live off $2 a day, conservation is obviously going to take a back seat to eradicating poverty. The biggest challenge to conservation in Indonesian Borneo could come in a transmigration program that was announced recently. The federal government has developed a plan to move some forty million people to less densely populated areas like Borneo! The plan has met resistance and the Regent of Sintang District,West Kalimantan was quoted as saying " The district of Sintang as a protected reserve area, cannot accept transmigrants" The Governor of West Kalimantan, was equally critical of the transmigration proposal, calling it an action to move impoverished people from one region to become impoverished people in another region. Add the plans to open up 584 square kilometers of palm oil along its border with Malaysia to see how things don't look good for the orangutan populations in Indonesian Borneo. Rich rainforests like the Leuser Ecosystem which is home to the very endangered Sumatran orangutan, seem to mean little to governments that sees it as merely benefitting a few local communities even though tens of thousands of foreign activists have called for its preservation. Even national parks, like Gunung Leuser, Sebangau and others are constantly being encroached by humans looking for a home or a piece of farm land. There isn't enough funding from traditional conservation funds to tackle the problems. This is why companies that grow or use palm oil, like McDonald's , must come through with conservation funding even as they try and figure out how to use palm oil responsibly. I can guarantee you that conservation groups working in the Leuser Ecosystem would love funding like what Anheuser-Busch is giving to national parks in the U.S. Yet funding sources from palm oil growers or users get tagged as a greenwash by social media activists. This attitude is completely wrong and has done little for conservation. We need a new approach where companies that grow or use palm oil, must come through with support for conservation, whether in situ or ex situ. One potential new source for conservation may come from the Roundtable on Sustainable Palm Oil's(RSPO) Compensation Program. This is where some of their members have admitted to clearing orangutan habitats in the past and are now looking to make up for their past mistakes by protecting forests. It's still too early to tell whether this program will be a saving grace for the RSPO whose members have long been accused of deforestation. If it's kept honest, we could see millions of dollars come available for conservation in Indonesia. As a model of zero net deforestation, albeit a retroactive one, imagine the good this funding can do for orangutan habitats like Sebangau National Park which is severely degraded. Funding is also needed for local communities that live in or near protected forests. It's been well documented that Tribal peoples are better at looking after their environments than anyone else as as their survival depends on it. Out of Indonesia especially, there are numerous stories of communities that are fighting to maintain their forest lifestyles "in harmony with nature and wildlife." These are exceptional cases and not a strategy for long term conservation as sooner than later, the younger generations will abandon the forests for the towns and cities if conditions in their villages do not improve. Getting these forest communities to "save the forests for orangutans" for the long term will need external support. Maybe not to the extent of having a flat screen TV in every house, but at least the chance to upgrade their lives with say, electricity for light bulbs. I had a peek into one community forest in West Kalimantan recently. You could still see every wild plant and animal found in Borneo in this 14,000 ha forest that is surrounded completely by industrial palm oil plantations. A few hundred wild orangutans live in this forest but without external support, it will be lost forever. Illegal logging and mining by local villagers has already destroyed 1000 hectares of it. Compromise will be key to conservation in Indonesia. Compromise between government and conservation to find the best solutions for sustainable development. I am working on a project in Central Kalimantan where the government wants to open up an area for development. The community in the area wants the benefits that could come from the presence of an industrial plantation but fearful at the same time as these sorts of plantations have a bad rap. It will be a challenge to persuade the community to give up some of its ancestral land claim, yet another challenge to persuade interested companies that their presence must yield solid benefits to the community. The biggest challenge will be to persuade the government that some forested areas must remain. Yet it's completely doable if all parties compromised.